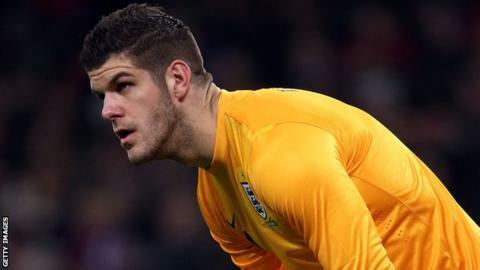 Celtic manager Neil Lennon has urged Fraser Forster not to take England's defeat by Chile on his international debut to heart. The 25-year-old started ahead of out-of-form Manchester City goalkeeper Joe Hart in the 2-0 defeat at Wembley. "I am delighted Roy Hodgson gave him the chance and I just hope that he is not too disappointed at the result," said Lennon. "Hopefully he can kick on from that as I don't want it be a short-term thing." Forster generally escaped blame for the two goals Alexis Sanchez scored on Friday and was praised for a couple of fine saves. Speaking on Sky Sports, Lennon said one of the main improvements Forster has made since arriving at Celtic Park from Newcastle United was his kicking. "What our goalkeeping coach, Stevie Woods, found out was that he is naturally left-footed - Fraser didn't know," said the Celtic boss. "Now he can kick equally well off both sides." Speaking after winning his first cap, Forster also highlighted the progress he has made at Celtic. "It's fantastic to make my debut," he said. "I've worked very hard ever since coming to Newcastle to get to this point. "I've had a taste of international football being in and around the squad and this is what you want to be a part of. This is what you dream of as a kid. "It's brilliant. It's a real inspiration to make me go and work harder." Hart will be back in goal against Germany on Tuesday, despite being dropped at club level, meaning Forster will have to bide his time, as will Norwich City's John Ruddy. However, the Celtic goalkeeper thanked Hart, 26, for his advice ahead of his debut. "Joe was fantastic," Forster said. "He talked to me a lot before the game and at half-time. He's obviously very experienced at this level and a top-quality keeper. "He's a fantastic guy and I can't speak highly enough of him." Forster expects Hart to respond well to his recent downturn in form. "Joe's proven what a top-class keeper he is and made save after save," said Forster. "He'll come back stronger. He's one of the best people I've come across in football. "It's just a case of me doing as well as I can at club level and, when I'm with the squad, just trying to make as good an impression as I can. "It's just a case of waiting your turn and trying to impress in training."